Teen Vogue has a big ol' crush on ballet, and we couldn't be happier about it. The magazine regularly profiles gorgeous up-and-coming ballet dancers, and its "Strictly Ballet" web series—a behind-the-scenes look at life at the world's top ballet schools—gives us LIFE (can we get a Season 3, please?). Most recently, the mag went inside a rehearsal at the prestigious ABT Studio Company, the American Ballet Theatre feeder boasting a slate of incredibly talented young dancers. (A special shout-out to ABT Studio Company director Kate Lydon, our former editor in chief!) The resulting video paints an intimate portrait of George Williamson's Murmuration, a lush, passionate ballet made for the Studio Company dancers that premiered last week in NYC. We see the familiar stop-and-start process of choreographic creation, and watch the dancers figure out the work's technical and artistic puzzles. "You give them the material, but you can't tell them how to take every step," Williamson says. "That's part of learning how to be a mature dancer: You have to go from A to B, but not do it in the way you'd walk to the bus stop....They have to learn how to speak in the language of the piece." The annual Destiny Rising gala benefits the awesome New York City Dance Alliance Foundation, which is dedicated to helping young dancers fund their college educations. 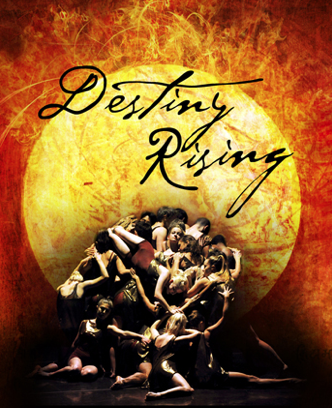 So how fitting is it that at last night's Destiny Rising performance, it was a college dance company that stole the show? That would be the Conservatory Dance Company of Point Park University, which performed Garfield Lemonius' Memoirs. I have this terrible stereotype in my head of college dance groups doing sedate, solemn, stuffy pieces, but Memoirs allowed Point Park's beautiful dancers to show us the full range of their talents. Clad in flowing red dresses, the company's guys and girls tore through the intricate, emotionally wrenching choreography. The best part? The cast included two of our favorite NYCDA alums, Kali Grinder and Victoria McWilliams, both recipients of NYCDA Foundation scholarships. And they were in top form. It looks like college has allowed them to both grow as dancers and mature as artists—and that's what the college dance experience is all about, Charlie Brown. That's not to mention all of the evening's other fun performances. For the bunheads, there was the ABT Studio Company's exceptional Catherine Hurlin and Oliver Oguma in the kicky Flames of Paris pas de deux, followed by New York City Ballet's Brittany Pollack and Jonathan Stafford (real-life couple alert!) in the White Swan pas. For the contemporary buffs, there was Cedar Lake standout Jon Bond's lush The Devil Was Me, featuring several other CL dancers (including our baby-who's-all-grown-up-now, Ida Saki). And for everyone, there was Grace Buckley's gleeful Sing, Sing, Sing, starring the likes of Amber Jackson, Corey Snide, Ryan Steele and Jakob Karr. They dared us to stop smiling. I couldn't. Want to find out more about the NYCDA Foundation and how you can apply for scholarships? Take a look at the organization's website. Remember back in September, when we told you about Christian Siriano's gorgeous Spring 2013 collection? It was inspired in part by American Ballet Theatre's performances of Frederick Ashton's The Dream, and the diaphanous tulle dresses in pastel hues certainly looked fit for a ballerina. Well, now the collection is hitting stores, and Siriano's designs are being modeled by ballerinas. Siriano chose three beautiful dancers from the ABT Studio Company—Katerina Eng, Isabelle Seiler and Carolyn Lippert—to wear his dresses for the collection's new ads. "I wanted the video to portray the dancers as if each were dreaming about the costumes they'd be wearing in a performance," he told Teen Vogue. Watch the three dancers glide ethereally through NYC's iconic Waldorf Astoria Hotel in the video below—then scroll down to take a look at a few still photographs from the campaign.